Many companies these days turn to certified fiber optic technicians to enjoy the benefits that fiber optic networks carry. But for these technicians to successfully install fiber optics in any business establishment, the measurement of their maximum fiber distances and signal losses are necessary. It’s not enough to rely on an estimation made by a fiber optic vendor, it has to be an accurate measurement if you want to maximize the power of optical fiber. Before delving into the measurement of fiber optic specifications, it’s important to understand the fiber modes, cable attenuation, launch power, receive sensitivity, and budgets. This allows you to perform fiber optic installations more smoothly and more efficient. First of all, you have to be acquainted with the terms commonly used for fiber budget calculations. That way, you’ll be able to understand what your technicians are doing as they install your fiber optic network. This is the amplitude or energy of light that leaves the technician’s fiber transmitter. The energy level of the launch power is usually measured in decibels (dB) that is relative to 1 milliwatt (mW). This is the minimum energy that’s required to detect an incoming signal in the fiber receiver. Receive sensitivity is also measured in dB that is relative to 1 mW. The receiver saturation indicates the maximum power input that a receiver can handle before it goes to overdrive. In the event you overdrive your receiver, you can experience data errors and data detection failures—and this can certainly cause your trouble for your technicians. Moreover, similar to receive sensitivity, this is also measured in dB relative to 1 mW. This is also referred to as the power budget. Your fiber budget is the result you get when you subtract your fiber optics receive sensitivity from its launch power. The attenuation is the decrease of signal strength during data transmission that is measured in decibels. This is commonly referred to as the opposite of amplification. And when it comes to attenuation, it’s normal to send signals from one point to another. In order for it to be understood easily, it is crucial that the signal doesn’t attenuate too much. This can be done by acquiring repeaters for your network at regular intervals. This is also known as the intermodal dispersion. Modal dispersion is defined as the multimode fibers’ major distance limitation. This normally occurs in multimode fibers when the light travels in multiple modes or reflective paths. As mentioned, knowing the maximum or minimum fiber distances of your optical fiber is vital in order to achieve successful fiber network installations. By doing this, your technicians will be able to avoid possible technical problems and conduct smoother installations. 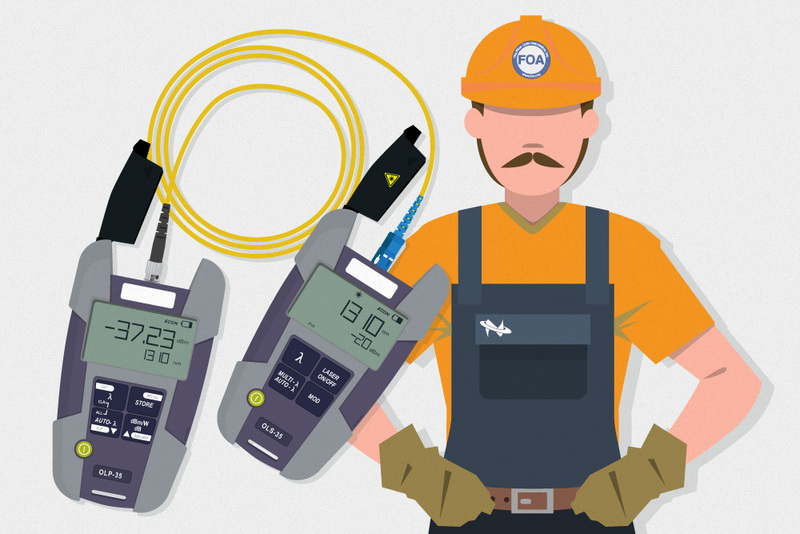 Accredited fiber optic technicians have to determine each and every one of your business’ fiber loss variables in order to get the exact measurement of your fiber distances. The ideal time to identify these variables is right after the installation of your fiber optic cables. This is a function of a wavelength that is required to be measured or specified in the wavelength used. Usually, attenuation happens when impurities in the fiber cabling glass absorb and reflect back light. This loss variable is only a concern to businesses that use multimode cables. And it is directly proportional to the data rate transmitted in the cable. When data rates are higher, the distance where the signal can travel becomes shorter. Modal dispersion then generates an inability to detect a “1” from a “0” in the data transmitted. Although it’s true that modal dispersion can only be found in multimode cables, there are still other dispersion effects that can affect single-mode fibers. One of these dispersive losses is the chromatic dispersion. This dispersion has the capability to limit Gigabit speeds and maximum fiber distances. In certain transmitter types, chromatic dispersion can cause varying travel times in the different parts of a light pulse. Splices may seem small and irrelevant at first, but it can definitely cause fiber losses in businesses. The average fiber loss acquired from splices is less than 0.1dB. Moreover, experts can attest that the failure to include splices in loss calculations can cause several errors. Another fiber loss variable prevalent in the business world is the connector. Connectors are vulnerable to dirt even when they are high in quality. And whenever they get soiled, fiber light waves can get completely obscured and this can undeniably create huge fiber losses for the company. Moreover, it’s important to remember that there will always be a minimum of two connectors in every fiber segment. Other than attenuation, modal dispersion, dispersive losses, splices, and connectors, a fiber cabling’s safety buffer can also affect your business’ fiber distance. Most often than not, technicians add a couple of dB of lose to serve as a design margin. And this allows 2 to 3 dB of loss when the fiber is aging, there is poor splicing, humidity, and temperature. Usually, there are two calculations that are necessary for fiber optics. One of them is used to determine the maximum signal loss and the other is utilized to identify the maximum fiber distance. In order to calculate the maximum signal loss of your fiber optics, you have to add all the worst case variables in your fiber segment. And the gravity of your losses is dependent on several factors. If you run 10 km of a 1,300 nm single-mode cable that has one splice, this is how you calculate the average losses and connector losses. Companies that are using single-mode products are usually the ones that experience overdriving their receivers—this is because of its low fiber attenuation. And as mentioned, overdriving fiber receivers can cause numerous issues. In order for technicians to avoid overdriving their fiber receiver and acquiring data loss problems, the signal’s maximum strength must be calculated. But even though it’s true, it’s important to remember that calculating the signal strength that exits the single-mode cable is only doing half of the job. As you can see, when the two numbers with the dBm unit of measure were subtracted, it got the difference with a dB unit of measure. And this is because of the fact that dBm is a logarithmic power ratio that is relative to 1 mW. That said, when you subtract two logarithmic ratios, you are also dividing two power measurements directly. And by doing that, you get a unitless number expressed in dB as the difference. In this example, it is shown that the system is capable to sustain a total loss of 98% of the light that’s being transmitted. In simpler terms, it’s important that at least 1/50th of the light should reach the receiver. When you use the units of measure dB and dBm, you are allowed to add and subtract reasonable numbers instead of multiplying and dividing large or small numbers. Moving on, you can also estimate the distance that you can run certain fibers by making a power budget. As you do this, you can make an assumption regarding the number of splices and connections your cabling to aid you in your calculations. And that’s how you calculate the distance you can safely run your fiber before you the signal of the receiving end disappears. In addition to the information presented about calculating your budget across multimode fiber, it is also necessary to calculate the losses caused by modal dispersion. That said, you can determine the maximum length of your fiber by using the distance calculation shown above or by modal dispersion. You see, as data traverses in multimode cables, it tends to spread an uneven lightwave that can generate a form of jitter. And according to experts, this jitter can cause data errors alongside the data rate increases.